After serving multiple combat deployments as an Army Ranger in my twenties and going on to write for a living in my thirties, I’ve found many books in the recent military history genre miss the mark. Palpable overtones of ego and exaggeration can stain otherwise brilliant pages. Furthermore, when a civilian writer steps in and tries to capture the fraternity of the military subculture, they typically fall short. With the growing debate of women’s role in war growing louder, I was intrigued to learn about a group of female soldiers that have, for years, been embedded with our US Special Operations units at war. “Their job was to be the softer side of the hardest side of war.” That razor blade of a sentence, perfectly etched, encapsulates the role of the U.S. Army’s Cultural Support Teams or CSTs. 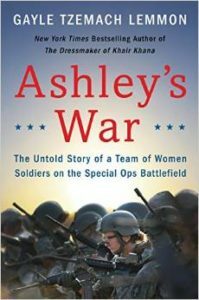 Ashley’s War: The Untold Story of a Team of Women Soldiers on the Special Ops Battlefield is not only an amazing inside look of a group of extraordinary soldiers, it’s a snapshot of an antiquated wall, crumbling. Author of the New York Times bestseller, The Dressmaker of Khair Khana: Five Sisters, One Remarkable Family, and the Woman Who Risked Everything to Keep Them Safe, Gayle Tzemach Lemmon has done something that few writers have been able to do. Gayle managed to capture the drive that exists in our Special Operation soldiers, the magnetic personal cohesion created by the arduous selection process required to work among the best in the world, and the level of camaraderie seared by war that perhaps only twins comprehend. The tempo of Ashley’s War keeps the pages turning. Even with the introduction and explanation of several detailed characters, the storyline never becomes convoluted. A couple of minor phrasing choices opens the story up for a more mass appeal. Despite being a war story, Ashley’s War avoids a flood of unnecessary military jargon, allowing those unacquainted with a soldier’s unique vernacular to follow the storyline without interruption. For some, I believe this book will be an informative and entertaining look at the relatively new role of women in special operations. However, for those with the capacity to read deeper, it is history in motion. Never before have we had such a front row seat for the changing of a cultural tide. Ashley’s War highlights a long overdue paradigm shift, one where over half of our population finally gains the ability to access a corner of the world that previously had a “No girls allowed” sign affixed. With precision accuracy, this book shows the merit and value of women in direct action capacity as well as a special operations role. I honestly didn’t think it possible to have more pride and esprit de corps for my unit, my military and my country than I do. Yet somehow, this book made me even more proud to have donned the uniform. It made me proud of our nations warriors, regardless of gender. It made me sentimental about the beautiful souls we lost. It made me thankful for those who continue to shoulder more of their share of the task, whatever it may be, so that citizens like myself may pursue all of the light that life has to offer. I can say with steadfast resolve that this is not only one of the best books I have read this year, it is also one of the most important. Ashley’s War does well to squelch the long-running gender clash of our modern military juggernaut. Showing, without prejudice, that women are not only willing, they are ready, to bear the burdens of their nation’s wars. Bottom line, read this book! This article was first published in The Havok Journal on 16 April 2015.